Today I ran the longest distance I shall run in marathon training, eighteen miles. I finished it in 3:33:39. Hard work, of course, particularly towards the end, but it was a beautiful morning on the downs, and I ran to High and Over, Bo Peep and up over Firle Beacon, then to Beddingham Hill, back on the ridge above Norton and Bishopstone, and a final couple of miles on the sea-front, where at Newhaven and Seaford Sailing Club I passed sailors derigging after the commissioning race, the first race of the season. In the aftermath, my legs and feet hurt, but also my shoulders, fall-out from yesterday's swimming coaching, but I have no more swimming coaching till after the marathon. I go into the next three weeks in better spirits. 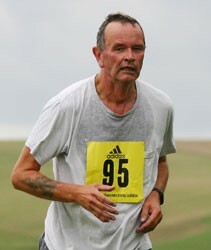 I have next week off, using up my last annual leave, so I will be able to run when I like.